It's beautiful to see how a small place can be utilized in such an efficient manner with eye-catching decors all over. I tried their Chimichangas which were burrito like rolls filled with caramelized onions and sauteed veggies, served with Mexican rice and beans. Absolutely loved it. I also had their thin-crusted wood-fired pizza, topped with loads of veggies and cheese. The pesto pasta was very creamy and cheesy! 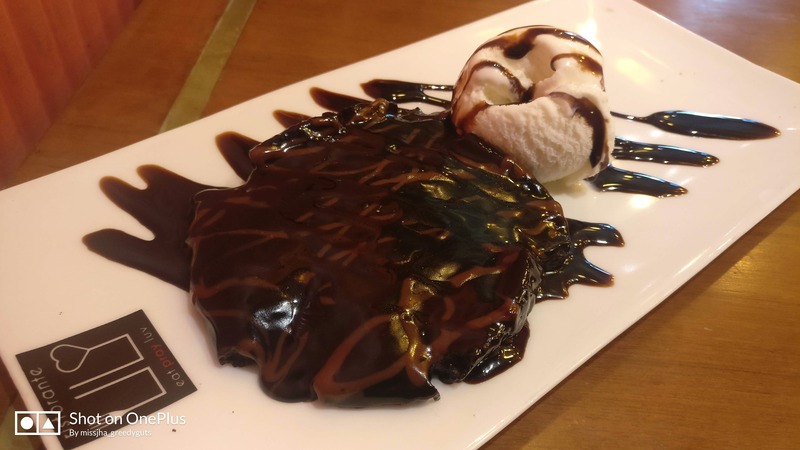 Last but not the least, the star of the meal was their chocolate lava cake served with vanilla ice cream, garnished with some Hershey's chocolate syrup which just melted in the mouth and a must try dish if you happen to pay a visit here.